Fantasy for Good: A Charitable Anthology is a fabulous anthology with all proceeds going to The Colon Cancer Alliance. I can wholeheartedly recommend this anthology. So treat yourself to a copy of Fantasy for Good. You get a great read while being charitable! The Table of Contents is below - check it out. From Sword and Sorcery to Paranormal Romance, from Weird Fiction to Fairy Tales, Fantasy For Good presents a wide range of exciting short fiction to accommodate every taste. In this collection of thirty stories, legendary authors (including NYT Bestsellers and World Fantasy Award winners) and great new up-and-comers in the genre spin tales of magic and mayhem. Featuring brand new fiction from Piers Anthony, Michael Moorcock, Carrie Vaughn, Kelley Armstrong, Alan Dean Foster, Katharine Kerr, David Farland, Jane Lindskold, Nnedi Okorafor, Todd McCaffrey and many more, alongside classic tales from George R.R. Martin, Jay Lake, Kevin J Anderson & Rebecca Moesta, and Neil Gaiman. Fantasy For Good also includes a classic tale by master novelist, Roger Zelazny, author of the Nine Princes in Amber, who passed away in 1995 after a battle with colorectal cancer. His son, Trent, provides a moving introduction. 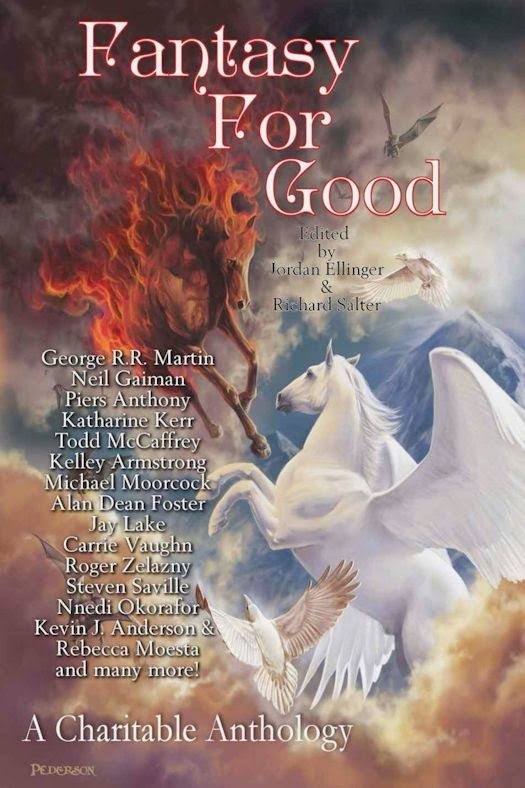 The release of Fantasy For Good: A Charitable Anthology including stories from George R.R. Martin, Neil Gaiman, Piers Anthony, Kelley Armstrong, Carrie Vaughn, Todd McCaffrey, and many more. All proceeds go to The Colon Cancer Alliance. PRLog - Dec. 9, 2014 - NASHVILLE, Tenn. -- Writers are a charitable bunch by nature. In 2012, a number of well-known horror authors were asked to contribute stories to a charity anthology. The result was Horror For Good: A Charitable Anthology, which raised thousands and continues to raise more for amfAR. Now it’s Fantasy’s turn, and these writers have been no less generous with their time and their talents. Stories by some of the biggest names in Fantasy fiction fill this exciting new anthology, running the gamut from urban fantasy to sword and sorcery. Piers Anthony, Michael Moorcock, Katharine Kerr, Carrie Vaughn, Kelley Armstrong, Alan Dean Foster, Jane Lindskold and David Farland are just some of the contributors of original stories, along with classic stories from Neil Gaiman, George R. R. Martin and Roger Zelazny, whose son Trent provides a moving introduction to this collection. Fantasy For Good is a labor of love for the editors and they are keen to extend their gratitude to everyone who donated their time and hard work to this project. No matter what your taste in fantasy fiction, this anthology is sure to appeal. Richard Salter is a British writer and editor now living outside Toronto, Canada. His debut novel, The Patchwork House, is also now available. His website is at http://www.richardsalter.com. Jordan Ellinger is a winner of the Writers of the Future contest, a graduate of Clarion West, and the editor of Urban Fantasy Magazine, which you can find at http://urbanfantasymagazine.com. Fantasy For Good: A Charitable Anthology, published by Nightscape Press (trade paperback and eBook) is currently available on Amazon for Kindle: http://amzn.com/B00NJY4GUE/ and in trade paperback: http://www.amazon.com/Fantasy-Good-Charitable-George-Martin/dp/1938644204. Horror For Good: A Charitable Anthology, which raises funds for amfAR, the Foundation for AIDS Research, is also available on Amazon for Kindle: http://www.amazon.com/Horror-Good-Charitable-Jack-Ketchum-ebook/dp/B0084FO7N4 and in trade paperback: http://www.amazon.com/Horror-For-Good-Charitable-Anthology/dp/1475065361.